Gently place the tomatoes on a wire rack on top of a baking sheet and drizzle with olive oil. Sprinkle with salt and pepper and roast at 300 degrees for 1 ½ hours. Remove from oven and rest at room temperature. In a food processor, add 2 cups of the basil leaves, garlic, pine nuts and ½ cup olive oil. Pulse to combine, scraping down the ingredients halfway through. Add the remaining basil, parmesan cheese and ½ cup olive oil. Puree until the ingredients have combined and the mixture looks like a paste. Stir in the lemon juice and season to taste with salt and pepper. Place a grill pan over high heat. Drizzle the sliced bread with olive oil. Place the sliced bread on the grill pan and cook until grill marks form. Turn over and repeat. Remove the bread from the grill pan and rub both sides gently with fresh garlic. 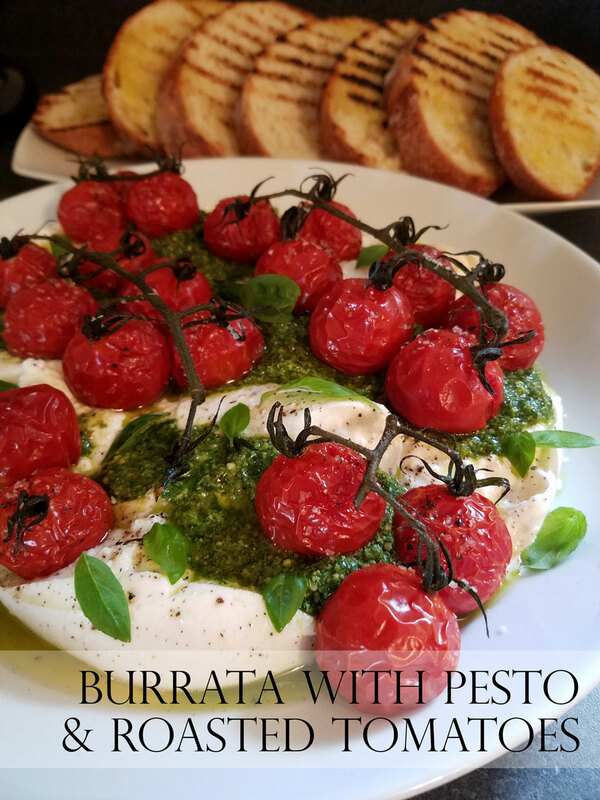 Drain the burrata cheese and cut each ball in half. Lay each half, cut side up on a large platter. Dot with the pesto (you will have leftover pesto!) and then drizzle olive oil over the top. Sprinkle with salt and pepper. Gently place clusters of the tomatoes atop the burratta. Garnish with baby basil leaves. Serve with grilled garlic bread.